SARE is an abbreviation for Sustainable Agriculture Research, Education and is an arm of the U.S. Department of Agriculture. Background: Organic and non organic sheep are having increasing difficulty with eliminating worms because the pharmaceuticals used for deworming are becoming less and less effective due to worms developing immunity. Today, more and more sheepmen are discovering the all natural application of garlic juice. In the attached study only 1/5 of an ounce (one teaspoonful) of garlic juice (with water added to make one ounce dose) was used 6 times during the year to bring worms in sheep under control. The garlic juice used was Garlic Barrier and is available to sheep and goat owners through our web site. Please click here to read the entire SARE study. Only the gallon size is 99.3% pure and is strength used in SARE report, suitable for deworming. Do not add the garlic juice to the sheep's watering trough. It will become rancid in a short time, additionally the natural oils in the garlic juice will rise to the top of the water and the rest of the juice will mix in the water. Both the juice and garlic oils are essential in treating parasites. Adding to water is not a recommended method. One gallon of cooking oil to 16 ounces (one pint) of Garlic Barrier - stir well. 16 ounces of garlic juice is enough to give one dose to 96 sheep. (If some sheep get more garlic it is alright). 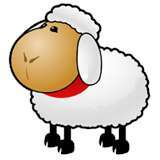 Get enough kelp or other leafy food that sheep will readily eat (alfalfa, clover, etc.) for 96 sheep to eat. Spray the oil/garlic juice mixture thoroughly over the kelp (or other greenery) and coat the kelp thoroughly. Once the kelp is coated with the cooking oil and garlic mixture - get enough salt (sea salt is preferred) and coat all the kelp that you have just mixed with the cooking oil and garlic mixture. Do this only in she shade - not in sunlight. Feed this to the sheep. They will normally only take in enough salt that they feel comfortable with and not over eat. Sometimes the sheep are initially reluctant to eat the garlic/oil mixture and you may have to squirt some in their mouths to get them accustomed to the garlic - after that taste they generally just gobble up the kelp and oil/garlic mix. When using a power syringe for dosing the sheep with Garlic Barrier, your spray nozzle may clog up because very small bits of "garlic dust" in the juice. We recommend you either remove the filter from the spray nozzle, or strain the garlic juice through a strainer or through cloth to remove the "garlic dust". Garlic and garlic juice is know in many countries to be an excellent dewormer. It is administered to sheep in many creative ways: Added to kelp, added to dry feed, mixed with molasses and salt, mixed with bread-molasses-milk and salt, etc. The main idea is to be sure that each animal gets at least a teaspoonful at proper intervals, you can give 2 teaspoonfuls if you feel the worm problem merits it. You can be creative in how you administer the garlic juice. If you find a truly unique and wonderful way to administer the garlic juice write to us and let us know how you did it and we will add it to our website with credits to you. Spray or heavily dab our garlic juice on top of the area damaged by screw worms. Sometimes you can immediately see the worms leave. You may have to repeat the treatment. Generally, one treatment does the job and the sheep's skin will become normal again. Question: If I feel my sheep are in very bad shape and I want to be sure to get rid of the worms right away can I give them extra garlic juice? Answer: Yes, typically a teaspoonful is 5 ml, you can give them 10 ml (two teaspoons full) or set your syringe for 10 ml and dose them. Question: Can I give too much garlic to my sheep? Answer: We don't know the answer to that yet, we need to do more testing. More garlic juice may upset their stomach, but, how much we do not know. Question: How much is a gallon bottle of Garlic Barrier (128 ounces)? Answer: A gallon bottle of Garlic Barrier is $82.50 with free shipping to residents in the contiguous United States. However, in order to obtain this special pricing, you must call our factory directly and place the order by telephone. Our toll-free number is (800)424-7990. Use any credit card. This is a special price and is available only to sheep and goat owners. Question: How long does Garlic Barrier last if I don't use it all at once? Answer: If refrigerated, Garlic Barrier can last up to 3 or 4 years. At ambient temperatures it is good for about 1.5 years. It's best to store Garlic Barrier in the coolest place available - like a basement. Question: Is it possible that some veterinarians won't recommend garlic juice because they don't make any money off of it? Answer: Could be. We are certainly willing, however, to sell our garlic juice to veterinarians at wholesale if they request it. Question: Can Garlic Barrier be used to treat goats? If so, how much Garlic Barrier should be used to treat them? Answer: Absolutely. To treat your goats, follow the directions for sheep listed above but double the amount of Garlic Barrier used. The price for a case of Garlic Barrier (a case contains four 1-gallon bottles) is only $297.00 and includes the UPS freight charges. That's a substantial discount over the single 1-gallon bottle price! More and more sheepmen turning to Garlic Juice for expelling parasites. Official NDOPA Study of garlic juice etc., on sheep. Maine Organic Farmers and Gardeners on controlling sheep parasites with garlic juice. Click here to read about Wind River Soay Sheep farm using garlic juice for parasite control. Ísfaxa Farm is using garlic juice to control parasites in their sheep. Click here to read a fascinating article from New Zealand on apple cider vinegar and sheep. Site and contents ©2018 Garlic Research Labs, Inc.